3.Six Spring make the AB Six Pack Care exercises to strengthen your abdominal. This Tuff Concepts home fitness machine is more efficient than common ones. You’re getting resistance on the way both down and up when doing sit-ups with it. The dual resistance means you can isolate and train your abs more range of motion. You’ll get the ideal amount of resistance on the way down and have the right amount of support customized to your exact fitness level coming up. 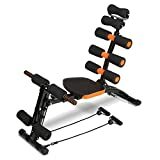 Best of all, exercising with it, you’re nestled in an ultra-comfortable seated position with your head and neck fully supported through the full range of motion. The thick foam cushion supports create an invigorating massage up and down your back as you train. This feels fantastic and will revitalize your spine and back so you walk away feeling wonder-full.